Bob Holz, popular drummer and band leader has formed A Vision Forward an exciting new group that includes contributions from music legend Larry Coryell on guitar Randy Brecker, and Ralphe Armstrong (ex-Mahavishnu Orchestra) on bass. A touring group has been formed after the recording of Holz's forthcoming CD, also entitled A Vision Forward containing Randy Brecker, Mike Stern and Steve Weingart. The album arrives in June 2016, via the international MVD Records label. "To learn from the past, embrace the present and chart new musical exploration: This is the essence of my quest as a musician," says Holz, who began his career in Boston attending Berklee. He went on to study with Billy Cobham in New York, and would go on to share the stage with Robben Ford, David Fat Head Newman, Cornell Dupree, Dr. John and George Clinton/ Parliament Funk. Bob's musical approach to drumming, along with his compositions provide a perfect foundation for the musical explorations of fellow musicians Coryell and Armstrong. Holz's A Vision Forward band comes with some hefty credentials: As one of the pioneers of jazz-rock, Coryell deserves a special place in the history books. Throughout his career he released albums that feature the very best jazz had to offer, including: John McLaughlin, Eric Clapton, Jimi Hendrix, Al Di Meola, Larry Carlton, Billy Cobham, Steve Gadd, Ron Carter, and Chic Corea. "Bob's album has a wonderful energy about it. His playing and tunes are a natural fit for what I do," says Coryell. Adds Ralphe Armstrong: "Bob makes my job easy. He lays down a great groove and has a unique ability to make good things happen in the studio and on stage." A passionate blend of fusion and contemporary jazz, A Vision Forward is a record that music enthusiasts won't soon forget. From the Salsa flavored title track, through the reflective pieces such as "Shared Sunsets" and the up-tempo funk of "Mighty Mojo," A Vision Forward is just what its title suggest. 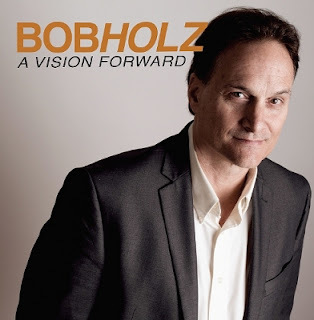 By blending the extraordinary musicianship of his band and special guests with infectious melodies and grooves, A Vision Forward brings the creative energy of Bob Holz, front and center. Both Bob Holz and this album are sure to make a lasting mark in the world of popular contemporary Jazz.